Rowan's nursery is officially ready, now all we need is for him to make an appearance! It has truly been a labor of love and I'm honestly surprised we pulled this off before his arrival. I'm pretty sure if my husband heard one more word about the rocker, shelves, or crib skirt I might have been a single parent. Though some of the DIY projects were a lot of work, I'm so happy with how everything came out! I wanted the room to be soft and calming but also have some masculine, industrial-like details that can grow with him. There was at least one pregnancy hormone-induced melt down about the presence of the queen bed in this room. I hate that it takes up so much space but with a 2 bedroom house, we absolutely need the extra bed for visitors until we can buy our first home (hopefully this Spring... yay!). 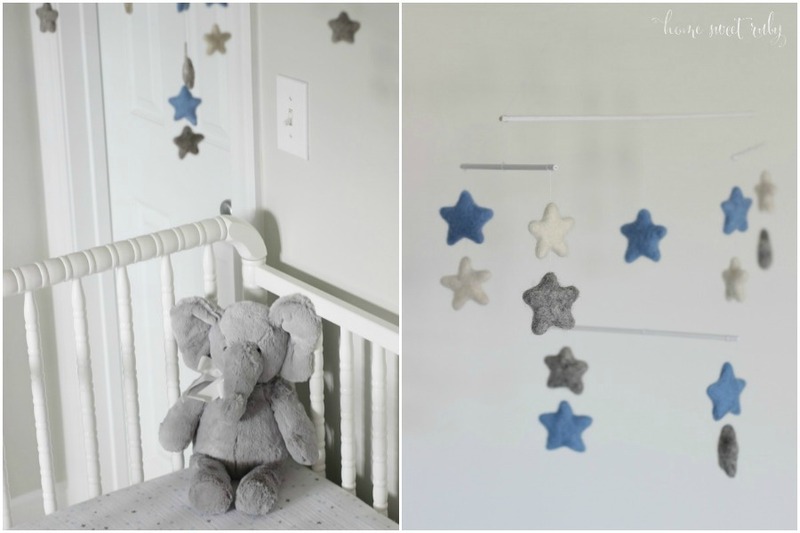 I tried to avoid a full-fledged theme but I did love the star bedding and that inspired the DIY mobile. One of my favorite items is the watercolor calligraphy print of lyrics from one of our favorite Coldplay songs, which went with the whole star thing too. And completely unrelated to stars, I threw in some adorable elephant details. Random combo I know, just go with it. I love my Kate Spade baby bag, which I got for 70% off during one of the big sales. The only downfall is not having a crossbody strap but I purchased one on Amazon and can clip it onto the stroller straps if needed. Not super glam, but functional. Our biggest splurge was the rocker, but it was completely worth it! You can remove the rocker legs to convert it to a traditional chair later on. Plus it was a quick ship option, we shipped it directly to the store for free, and used the 20% discount during the Pottery Barn Kids friends and family sale. Eventually we may get some kind of bumper and toddler quilt but since we can't use them until Rowan is older, I didn't bother. 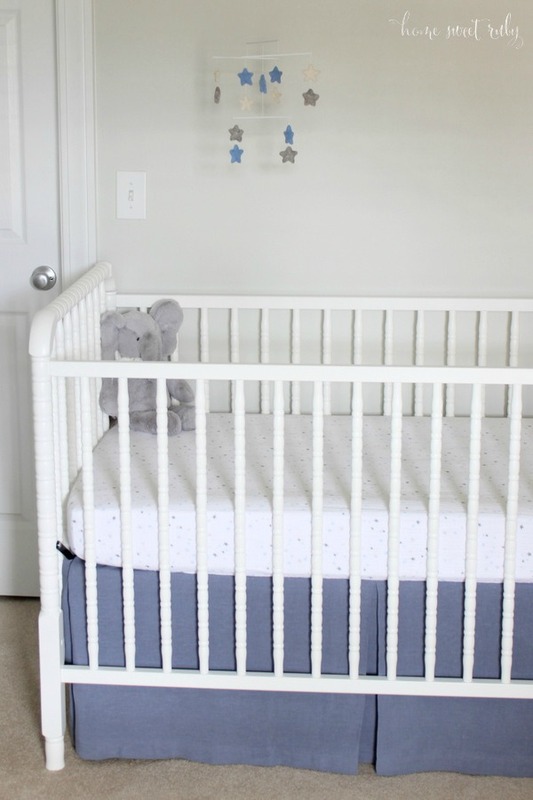 The crib skirt and curtains are made from Restoration Hardware flat bed sheets. I loved the color and couldn't find something similar anywhere else, but let me tell you... linen is not easy to work with! The crib skirt is adjustable (I used ribbons to tie it to the mattress frame) so I do love that aspect. 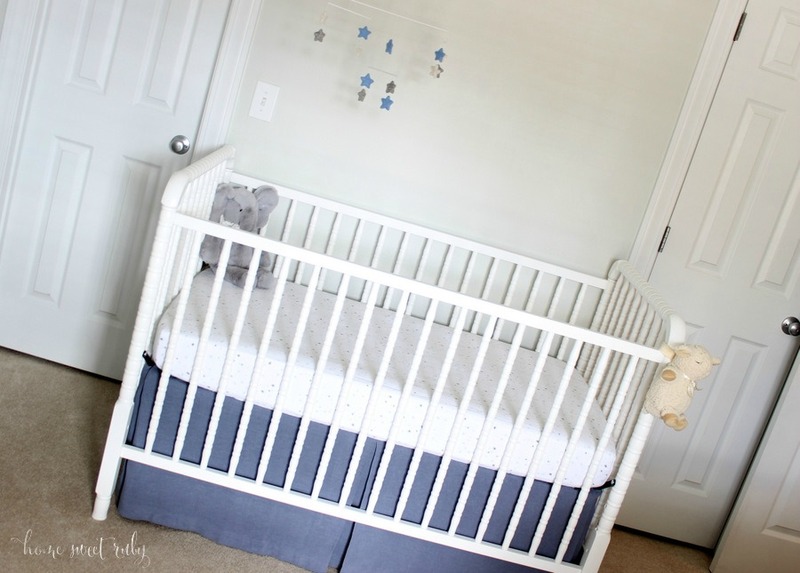 Wall Color: Benjamin Moore "Grey Owl"
Crib Sheet: Aden + Anais in "Night Sky"
Crib Skirt: DIY, using this RH Baby & Child Twin-sized flat sheet in "Ocean"
Changing Pad Cover: Aden + Anais in "Night Sky"
This room is PERFECT!!!!!!!!!!!! Breathtaking, I couldn't love it more! His room is so amazing! You did such an awesome job! I love the colors!! 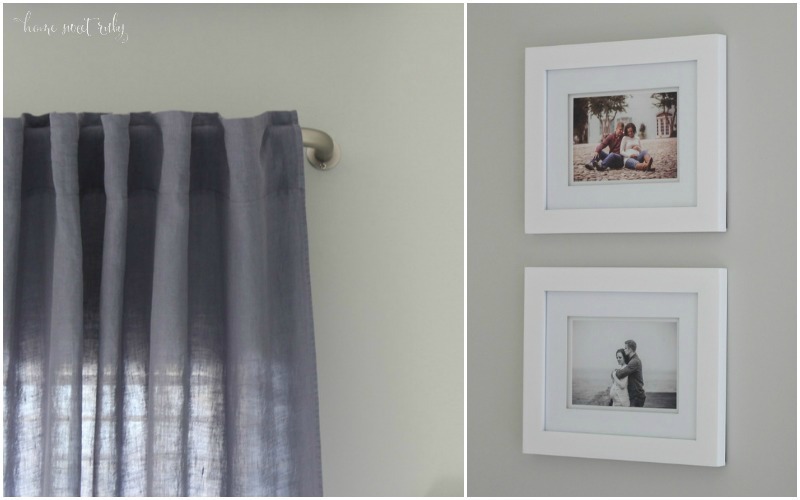 I am also very impressed with your DIY's and would love a tutorial on the curtains and bedskirt! Eeeek! I LOVE it! Everything turned out so well and I swear it just feels calming through the pictures! 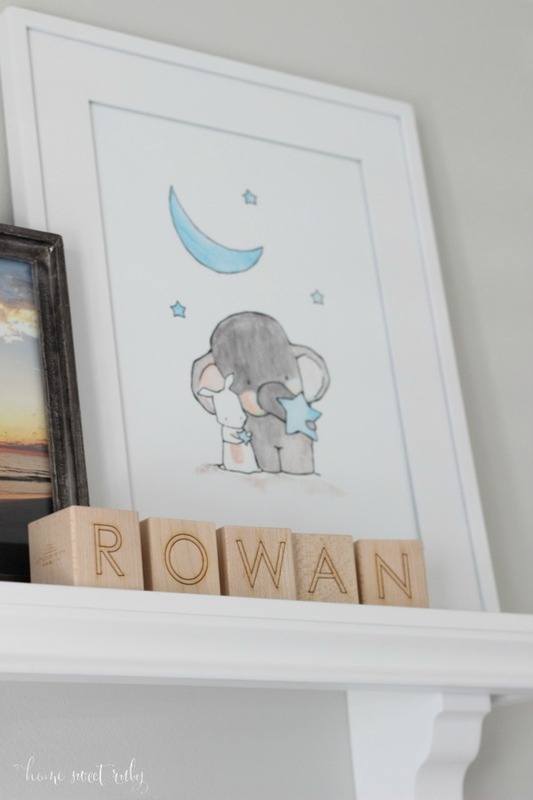 Can't wait to see baby Rowan in his new nursery - hopefully very soon! Love this room!! 'n you did an amazing job mama!! Beautiful! While the bed is for visitors I think you'll appreciate it during those rough nights. We lived in a two bedroom when Noah was born and I would have killed for a second bed! Some nights you have to just let one of you get a good night sleep while the other tends to the baby. 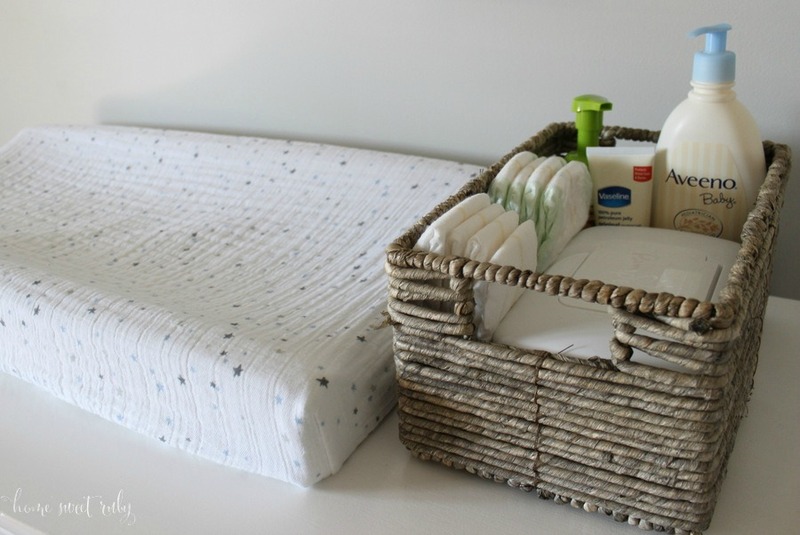 Having the bed in the nursery will definitely come in handy! I always tell my pregnant friends that if the room is big enough put a bed in there! OMG it looks so awesome!! I love all the little details!! I see my contribution to Rowan's room! You'll probably love having the queen bed in there because I'm sure you'll want to sleep right next to him! I really like that lamp, so masculine! You did such a good job! I was going to text you right before this and ask if you thought Rowan was going to make his appearance this week! LOVE this room! 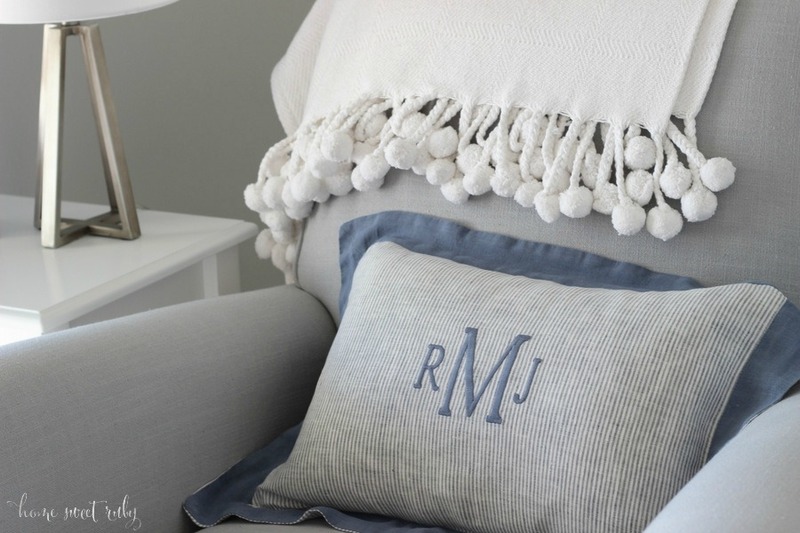 Love the color palette and the soft and warm, welcoming feeling! 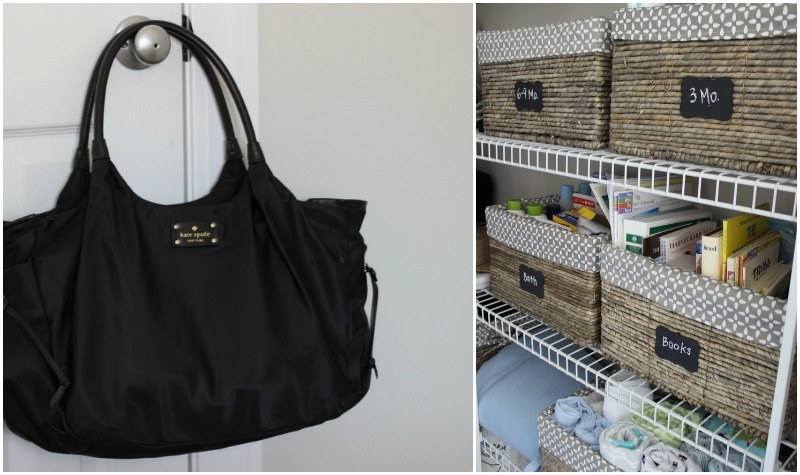 Where did you get the baskets that are in the closet? Beautiful nursery! Love the colors and the adorable stars! I honestly didn't even notice the bed in the room until I read it in the post, but if it bothers you have you thought of just getting a air mattress for guests? You probably already thought of it but thought i would suggest. Love the nursery!! This is so sweet! I love everything about this and how it turned out. I love it!!! 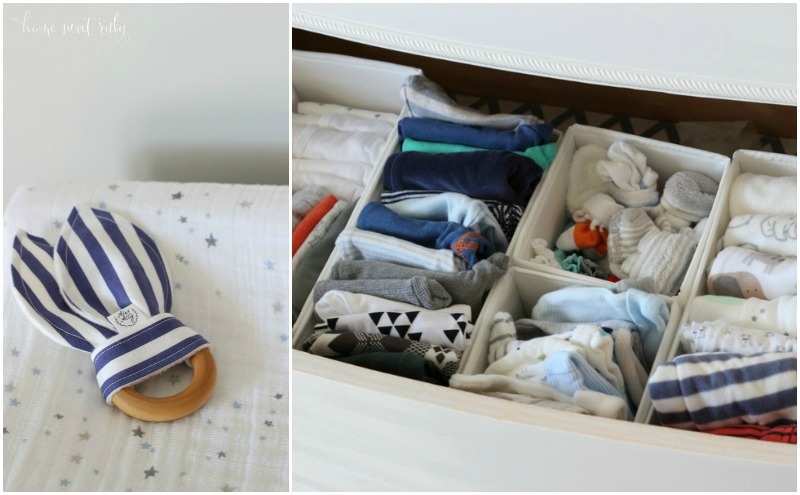 If we have a baby in our current house, which is likely, we are going to run into the same bed issue. My family lives in Chicago, and I can't have them sleeping on an air mattress when they come to stay for weeks. I think you made the bed look FLAWLESS in your nursery!! Love love love it!! It is just perfect!! This room is beyond perfect - I love it! Y'all did such a great job with it :) It just needs a little baby boy it now to make it complete. Very, very cute! Great job! The nursery came out BEAUTIFUL, great job! Girl, it's gorgeous. So bright and airy, I just love it. It is beautiful!! You did such a wonderful job...so impressed! Rowan will be in that crib before you know it! You found all your closet baskets at tj maxx?!? They're perfect. I'm looking for some just like them. Love his room. It's perfect. Can't wait to "meet" him! oh my goodness, it is seriously perfection! very calm looking, just the way you wanted it. can't believe he will be here so soon! Love love love!!!! Everything looks perfect!!! Great job! Now all you need is little baby R! 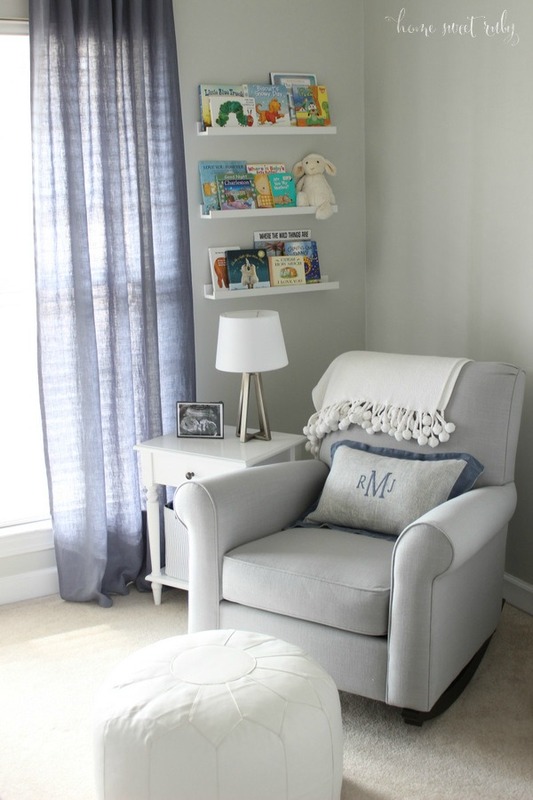 The nursery turned out amazing Caitlin!! It's exactly what I would dream up a nursery to be. Everything is just PERFECT! Now for Rowan to arrive!!!! This room is perfection! I got believe you made the curtains and bed skirt-it look's amazing! OMGGGG it looks SO amazing girl! I love everything about it! The colors are perfect and I love all the cute little touches. You did an amazing job! His room is just perfect! I am in love with every aspect! And that rocker chair?...perfection! Wow, Cait! This is seriously out of a magazine!!! And awesome job on the curtains and bed skirt.... LOVE them!! Such a sweet nursery! I'm obsessed with that rocker. 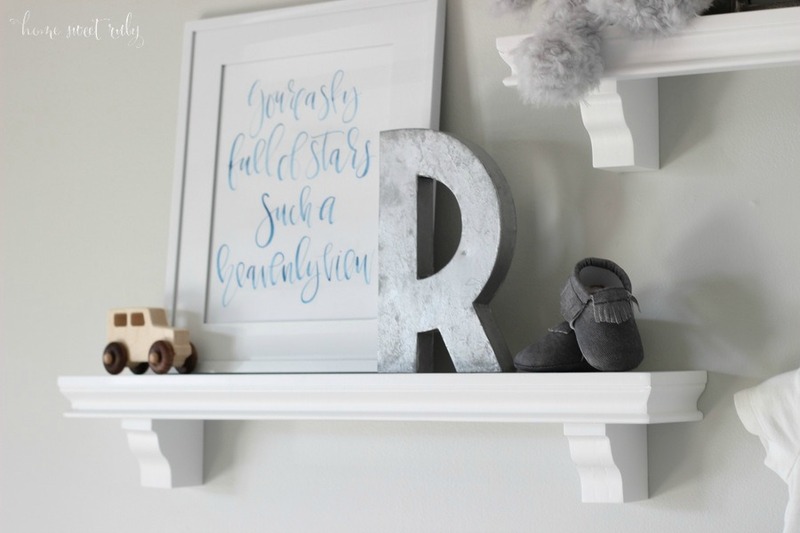 I need to find one soon for our nursery and I think Pottery Barn is at the top of my list. Beautiful nursery!! 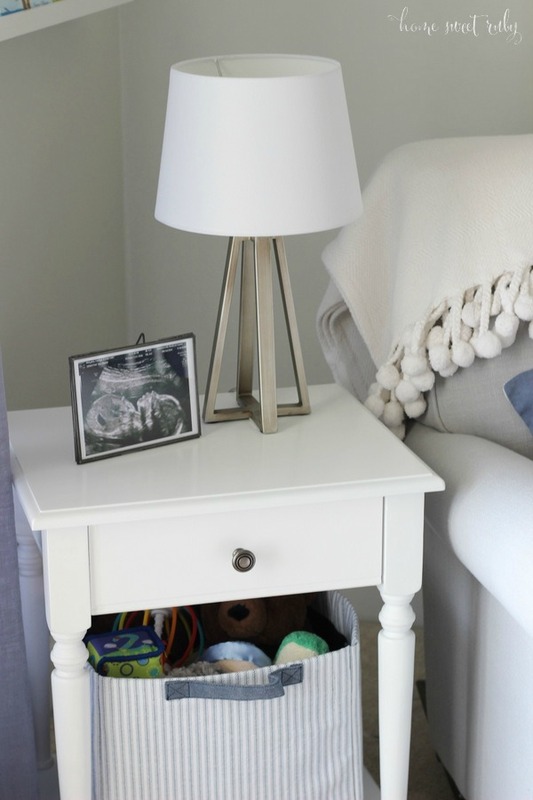 You did a really great job with everything ..it looks so perfect and ready for your little one's arrival! Where did you get the outfit from?! SO cute! !